Happy Friday and welcome to another fun party! 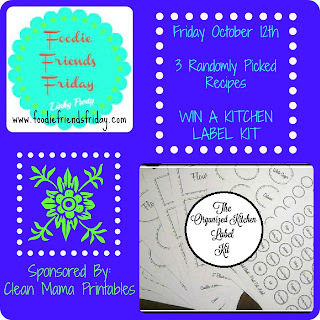 We have a wonderful prize for three randomly selected winners from Clean Mama Printables! She is all about home organization and has a variety of label kits to help keep you life in order. 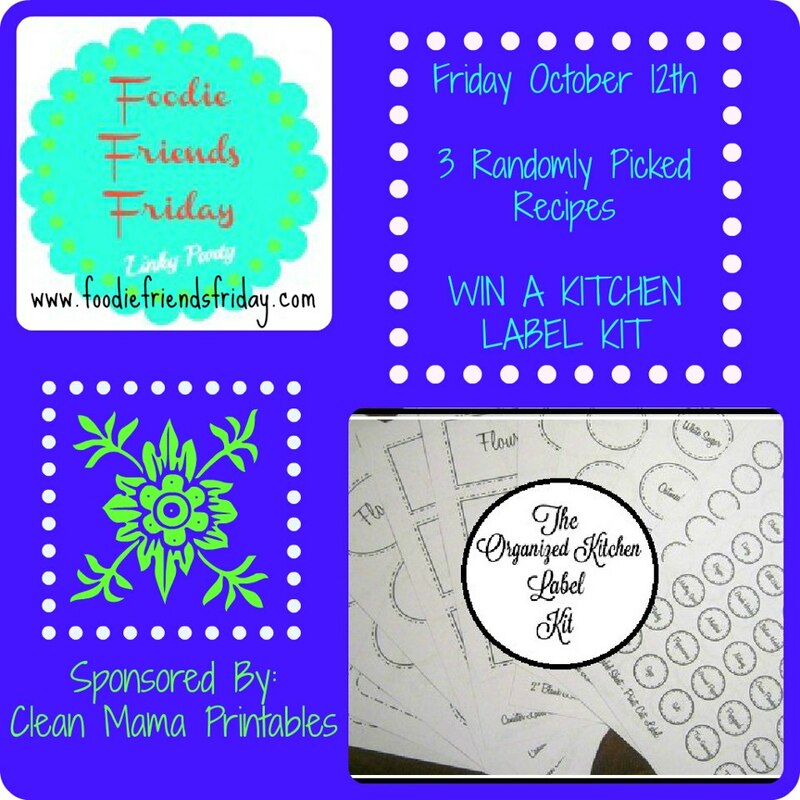 The winners here will receive her kitchen label kit to beautifully organize your kitchen. Good luck! It's a known fact...I love pizza. If I could have it every single day, I would. If you ask me, it's the perfect meal! It includes grains, dairy, and a variety of fresh produce! Sounds pretty balanced, huh? I love trying new combinations of veggies on my pizzas and boy did I find a winner! This Mexican pizza is PACKED with veggies and is even given an extra boost with a base of beans in lieu of the standard tomato sauce. This gives the pizza tons of fiber and a virtually fat-free source of protein. By making your "refried" beans at home, you have control over the salt levels, lowering the overall sodium content of this meal. Heat the oven to 475 degrees with a pizza stone inside. Ready your pizza dough/crust and add toppings. Start with an even layer of refried beans. Next add cheese. Then top with all the veggies except cilantro and avocado. Bake for 15 minutes or until cheese is melted and bubbling. Remove from the oven and add cilantro and avocado. Just before enjoying, top with salsa and chip pieces. I am always looking for ways to cut back on pre-made foods be they canned, bagged, boxed, or jarred. In my family, we go through our fair share of beans. Our favorites include black beans, pinto beans, and chickpeas. 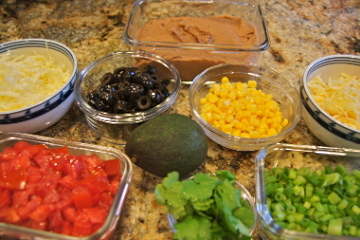 One thing I had relied on for many years was canned refried beans. I figured it would be WAY too hard to "re-fry" beans at home. Boy, was I wrong! This technique is so incredibly simple, you will wonder why you ever bothered buying canned beans before! All you need is a crock pot and a food processor or blender. That's it! There is no frying involved, and most of the work is done overnight while you sleep. Isn't that the best type of cooking? :) Seriously, the hardest thing about this is just remembering to cook them the night before you need them. But once you make it a habit, it just becomes part of your regular meal planning. Rinse the dry beans under running water to clean them. Place the beans, onion, garlic, salt, pepper, cumin, and jalapeno into a crock pot (I use a small one, but a larger one is great if you are making a bigger batch). Fill with water allowing space for the beans to double in size and stay submerged. Turn on low and cook overnight or about 8 hours. Drain the beans, reserving the liquid. Discard onion. Pour the beans into a food processor adding 4 Tbsp cooking liquid back in. Pulse until a good consistency adding more water as needed. Taste and adjust salt and seasonings as needed. Yup. I did it again! I have a new fresh salad I am obsessed with! I am on a roll! :) OK, self-praise is done. But you have to understand how great this is. I am really trying to integrate more fresh veggies into each and every day, so finding wonderful new salads is key. This was my first time trying un-cooked chard...and it was delicious! It was easy to eat because the leaves were cut thin, leaving crisp ribbons. Wash and dry the chard leaves. Remove and discard the stems. Stack the leaves and chop into very thin ribbons. Make vinaigrette: mash the garlic and season with salt. Continue to mash into a paste. In a small bowl, whisk together the garlic paste, oil, vinegar, shallot, chile pepper, salt and pepper to taste. 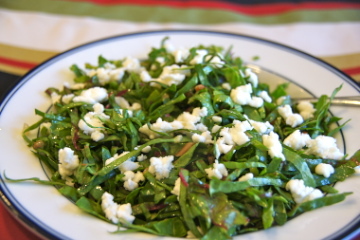 Assemble the salad: place chard ribbons into a bowl and add some vinaigrette (a little goes a long way), then toss to combine. Sprinkle mozzarella on top and serve. Enjoy!